Below is a brief overview over Kenya history: early history, the Arab period, the coming of the Portugese, British colonisation, independence after 1963, and the Cold War period. Kenya has been called the ‘cradle of mankind’: the place where the first humans appeared. Fossils found in the Great Rift Valley, around Lake Turkana (in the north of Kenya) suggest that hominids (the family of man apes and humans) walked around there several millions of years ago. But there are little remains and a new find could change the theories quickly. A key figure in researching Kenya’s prehistoric past was the British-Kenyan anthropologist Louis Leakey. Many remains are displayed in the famous Kenya National Museum in Nairobi, where they have met with fierce opposition from Kenyan Christians, who find them to be insulting to their religion. The current tribes in Kenya – like elsewhere in East Africa – can be divided into three (language) groups: the Bantus, Nilotes and Cushites. The Cushitic-speaking peoples moved into what is now Kenya from north African territory around 2000 BC. They were hunterer-gatherers, but also livestock herders and farmers. A new phase in Kenya history was born. Today they form only a small part of the population: for example the Somali, Boni, Rendille and Wata tribes are Cushitic. More important for Kenya were the Bantu and Nilotic peoples, who moved into the area from about 400 AD on - an important phase in Kenya history. The Bantu peoples came from the Nigeria and Cameroon region (in West-Africa). From them, the Kikuyu, Mijikenda, Dawida, Taveta and Akamba tribes emerged. The Masai, Luo, Kalenjin and Turkana tribes are Nilotic. Together they form the bulk of the Kenyan people nowadays. Especially the Bantus brought new technologies, such as iron working. They were mainly farmers but they supplemented this with herding, fishing, hunting, gathering and trading their iron products with the other tribes who mainly limited themselves to hunting and gathering. By 1000 AD the techniques from the Stone Age had been replaced by those from the Iron Age throughout Kenya, and more sophisticated farming methods were developed. From about the 7th century on, Kenya history underwent a big change when Arab traders started coming to Kenya by dhows (boats) over the Indian Ocean. During the 8th century, Arabs and Persians founded colonies along the coast and came to dominate a large part of what is now Kenya for many centuries to come. This is how Swahili (together with English the official language of Kenya) appeared: a Bantu language with many Arabic loan words. Swahili became the ‘lingua franca’ (general language) between the many tribes. The Arab and Persian traders also brought religion with them – today the majority of the people in the coast region are Muslim – and from the beginning they traded slaves, transporting them to the Arab Peninsula, the Persian Gulf and other Asian regions. 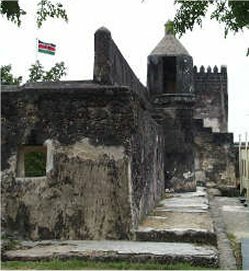 In 1498 Portuguese explorer Vasco da Gama’s ship landed in what is now Malindi, a city on the Kenyan coast, on his route to India. The European colonial period of Kenya history began. In 1515, Francisco de Almeida’s armada staged a full-scale invasion of several coastal cities. In 1525 the Portuguese returned again to sack Mombasa, now the second city of Kenya. In Mombasa they built Fort Jesus as a stronghold, which still is a main tourist attraction. However, the Portuguese only gained a partial control over the region. The Arabs kept several strongholds and attempts to convert the population to Catholicism generally failed. In 1698 Mombasa fell to the Arabs from Oman after a 33-month siege and in 1729 the Portuguese left East Africa for good. The Omani Arabs, who heavily increased the slave trade, were regarded by the Africans with the same hostility as the Portuguese. Oman came under British influence, and became a British protectorate. The British would be the next external force dominating the region. At the 1885 Berlin conference, at the height of European colonialism, the European powers arbitrarily divided Africa among themselves. Germany was to get Tanganyika (Tanzania), Britain was awarded Kenya and Uganda. The British were more interested in controlling Uganda (because of the Nile river) than Kenya, but needed Kenya in order to do that. The Imperial British East Africa Company (IBEAC) was authorized to set up commercial operations in Uganda and Kenya, but when it failed it’s mission, Kenya and Uganda were made a direct British protectorate in 1895. The British began building a railroad through Kenya, which would become a decisive factor in Kenya history. Several factors led to African resistance against colonisation. After decades the British had taken the bulk of the land suitable for farming – especially the highlands which were declared solely for whites - pushing aside the original inhabitants or turning them into squatters without rights. The British introduced taxes, but as there existed no money, Africans were supposed to pay them through labour. This way, the squatters were more or less forced to labour on the lands from which was taken from them by the British. Cash cropping was discouraged or banned for Africans on their own plots. Coffee licenses, for example, were strictly reserved for whites. Moreover, World War I proved that Europeans were not so civilized as they appeared to be. The British lost a lot of prestige in the eyes of Africans. Several movements began to agitate against colonisation. They became more aware of their own Kenya history. Interestingly enough they were generally started by Kenyans which had attended missionary schools, where they had learned about justice, freedom and love. One of them was Harry Thuku, who was sent to prison for 11 years for organising mass protests in 1921 with the Young Kikuyu Association that he co-founded. This organisation went over into the Kenya African Union (later renamed Kenya African National Union or KANU), led by Jomo Kenyatta. The famous Mau Mau rebellion from 1952-1960 was the culmination of these protests. This was led by the Kikuyu, who suffered heavily from British land politics as they had lived in the highlands before colonisation. On December 12th, 1963, the British granted full independence to Kenya. 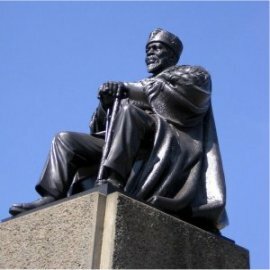 KANU leader Jomo Kenyatta (a Kikuyu) became it’s first president. This was the first period of freedom in Kenya history for a long time - at least formally, because the Cold War ensured plenty of Western grip in the next phase of Kenya history. Although the British had sentenced Kenyatta to 7 years of hard labour for his role in the Mau Mau rebellions, Kenyatta followed a course of reconciliation. He asked white settlers not to leave Kenya, let many colonial civil servants keep their jobs, and made Kenya a member of the British Commonwealth. In the Cold War he followed a pro-Western, anti-communist course (more on our separate page about Kenya and the Cold War). Foreign investments flew in because of Kenya’s relative stability and Kenyatta had political influence throughout Africa. A relative prosperous phase in Kenya history began. However, Kenyatta was criticized because of authoritarian politics and favouritism: during his land reforms the best pieces of land went to his relatives and friends (the “Kiambu Mafia”), and Kenyatta himself became the nation’s largest landowner. After Kenyatta’s death in 1978, Daniel Arap Moi – vice president under Kenyatta – became the second president in modern Kenya history. The authoritarian traits of Kenyatta’s government increased. After a coup attempt against his government in 1982, he tightened his grip on the country. He had the main conspirators executed, changed the constitution to outlaw all political parties other than KANU, and put his friends on important government positions. However, he was rather popular among the population, regularly visiting many parts of the country. Arap Moi received support of the West, who saw in him a bulwark against communist influences from Tanzania, Ethiopia and Uganda. After the end of the Cold War, this support fell away. Foreign donors, including the USA, now withheld financial aid if Moi would not allow political reforms. So in 1992 elections were held again, and Moi won these as well as the 1997 elections by skilfully exploiting fear of the smaller tribes that they would be dominated by the big tribes. Also election fraud may have taken place. Arap Moi was found guilty of corruption, too. The Constitution forbade Arap Moi to run again for president in the 2002 elections. Mwai Kibaki won the elections on the promise to fight corruption, and became the third president. Kibaki had been a minister under Arap Moi, but fell out of favour with Moi in the 1980s. Kibaki was praised for abolishing school fees for primary education. This program saw nearly 1.7 million more pupils enroll in school by the end of 2004. On the other hand, critics say he has done little to fight corruption and done much to take good care of himself. From 2003 to 2006, Kibaki’s cabinet spent 14 million dollars on new Mercedes and BMW cars for themselves. Kibaki lost the 2005 referendum on a new Constitution, after he changed the constitutional proposals to increase the power of the president.